A 50-year-old male patient with Type-2 diabetes mellitus and hypertension for the past eight years presented in December 2009 with complaints of low-grade fever, not associated with chills and rigors but associated with myalgia. He had received herbal medicine and non-steroidal anti-inflammatory drugs elsewhere before presenting to us (details are not known). Two days after this, he developed anuria and was admitted in Nizam's Institute of Medical Sciences, Hyderabad, India with nausea, vomiting and breathlessness. No past history of diabetic retinopathy and nephropathy could be elicited. Two months earlier, the serum creatinine was normal and proteinuria was 300 mg/day. On examination, pedal edema was present. Laboratory investigations revealed the following: hemoglobin 14 g/dL (normal range 12-15 g/dL); packed cell volume (PCV) 43 vol% (normal 40-50 vol%); total leukocyte count 7,600/mm 3 (normal 4,000-10,000/mm 3 ); platelet count 1.4 lakhs/mm 3 (normal 1.5-4.0 lakhs/mm 3 ); blood urea 126 mg/dL (normal 15-40 mg/dL); serum creatinine 9 mg/dL (normal 0.6-1.5 mg/dL); serum sodium 126 meq/L (normal 135-145 meq/L); serum potassium 4.4 meq/L (normal 3.5-5.0 meq/L); total bilirubin 2.2 mg/dL (normal 0.1-0.8 mg/dL); conjugated bilirubin 0.7 mg/dL (up to 0.25 mg/dL); serum glutamate oxaloacetate transaminase (SGOT) 362 U/L (normal 5-40 U/L); serum glutamate pyruvate transaminase (SGPT) 1,239 U/L (normal 5-40 U/L); alkaline phosphatase 197 U/L (normal up to 270 U/L); total protein g/dL (normal 6.0-7.5 g/dL); albumin 3 g/dL (normal 3.0-5.0 g/dL); creatinine phosphokinase 97 IU/L (normal 51-294 IU/L); amylase 108 U/L (normal up to 200 U/L); lipase 297 U/L (normal up to 160 U/L); calcium mg/dL (normal 8-10.5 mg/dL); phosphorus, 3.9 mg/dL (normal 3.0-4.5 mg/dL); uric acid 12.9 mg/dL (normal 3.0-5.0 mg/dL); urine for myoglobin, negative; urine: albumin 2+, sugar nil, RBC 4-5, leukocytes 4-5; urine culture, sterile; blood culture, sterile; anti-dengue IgG and IgM antibodies negative; anti-chikun-gunya antibody IgM negative (rapid test); anti-leptospira antibody IgG and IgM (rapid test) negative; ultrasound abdomen: right kidney 10.3 × 5.8 cm, left kidney 9.8 × 5.7 cm; anti-nuclear antibodies, negative; anti-neutrophil cytoplasmic antibodies, negative; serology of hepatitis A, B, C and E virus, negative. The patient was given hemodialysis support and stabilized. Since anuria persisted, a renal biopsy was performed by an experienced nephrologist using automated spring-loaded gun (Bard Biopty guns, C. R. Bard, Inc., USA) 18 G, under real-time ultrasound guidance. Two cores of renal tissue were obtained from lower pole of the left kidney, one for light microscopy and the other for immunofluorescence. Pre-biopsy bleeding time, clotting time, prothrombin time, activated partial thromboplastin time and platelet count were within normal limits. The blood pressure was 120/80 mmHg before and after the procedure. The procedure was uneventful and there was no immediate peri-nephric hematoma post-biopsy. Two hours after the renal biopsy, the patient complained of severe pain in the left loin; ultrasound did not reveal any hematoma and hemoglobin remained the same. The severe pain lasted for about an hour and necessitated use of analgesics and sedatives. Four hours after the procedure, an ultrasound abdomen was normal, but hemoglobin had decreased to 10.3 g/dL. Hematuria was not observed as he was anuric. The patient did not cooperate for renal Doppler because of loin pain and abdominal distension. Eight hours after the biopsy, the patient developed abdominal distension, not associated with pain and hemoglobin dropped further to 9.1 g/dL. 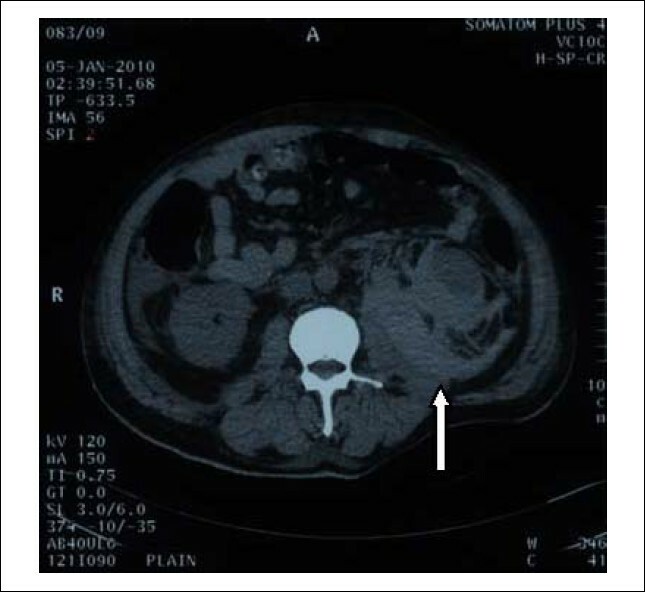 Computed tomography (CT) scan of the abdomen was performed; it showed a perinephric hematoma measuring about 300 mL around the left kidney [Figure 1]. He was given two units of packed blood cells. About 15 hours later, the hemoglobin had dropped further to 7.8 g/dL which was managed with two more units of packed blood cells. 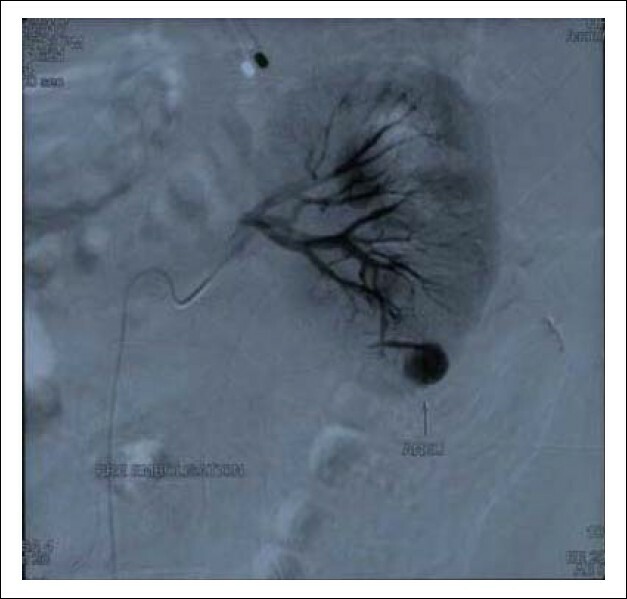 Selective left renal arteriogram revealed a pseudoaneurysm arising from the segmental artery of lower pole of the left kidney [Figure 2]. Super-selective cannulation of the involved artery was done with microcatheter (Progreat/2.7-2.9 F/Terumo). The distal tip of the microcatheter was placed in proximity to the pseudoaneurysm. Microcoils (0.018″/2 mm diameter, 2 cm length/Cook-Hilal) were used to obliterate the flow [Figure 3]. 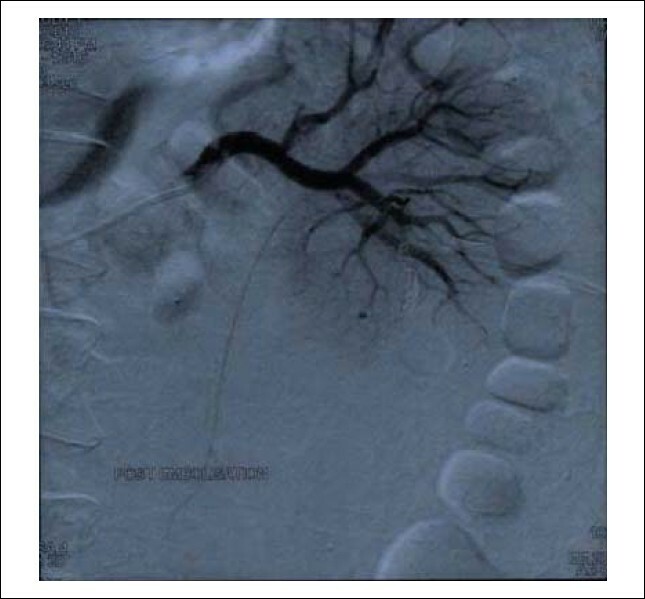 Post-embolization check arteriogram revealed no flow into the pseudoaneurysm; however, early opacification of the draining vein was seen from the proximal segment of the involved artery, which was suggestive of an AVF. The AVF component was subsequently embolized with liquid embolic agent N-butyl-cyanoacrylate (NBCA) (Histoacryl/BBraun, Germany) in 20% concentration mixed with Lipiodol Ultra fluid (Guerbet, France). Post-NBCA embolization check arteriogram revealed obliteration of flow into the fistula [Figure 4]. After the procedure, the hemoglobin was maintained at 10.4 g/dL. Renal histology showed acute tubular necrosis with acute interstitial nephritis. He received few more sessions of hemodialysis over the next two weeks, following which the urine output improved and renal parameters were normalized. Figure 1: Computed tomography scan of the abdomen, showing perirenal hematoma of the left kidney following biopsy (arrow). Figure 2: Selective renal angiogram showing pseudoaneurysm arising from segmental artery of lower pole of left kidney. Figure 3: Angiogram showing arteriovenous fistula and microcoils within the pseudoaneurysm (arrow). 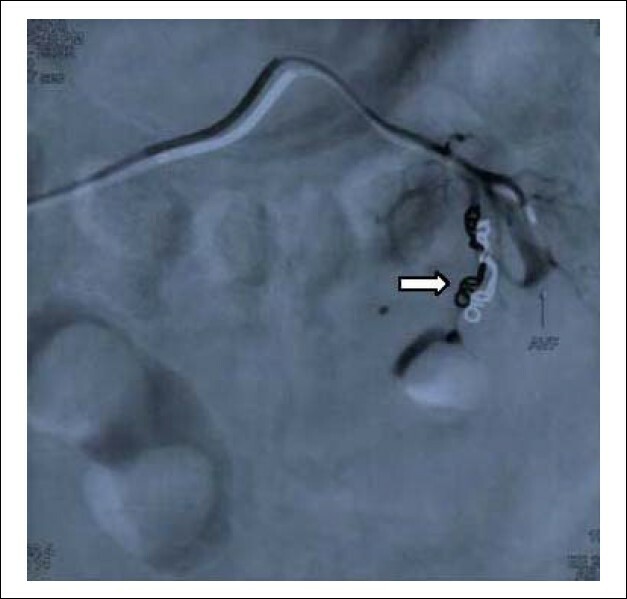 Figure 4: Post-embolization angiogram showing successful obliteration of both pseudoaneurysm and arterio-venous fistula. After renal biopsy, a dull ache around the needle entry site is inevitable when the local anesthetic effects wear off. This ache often requires no treatment or just simple analgesia with paracetamol or paracetamol/codeine combinations. Our patient had severe left loin pain that necessitated powerful analgesics (Inj. Tramadol hydrochloride) and sedation (Inj. Pentazocine). Since his pain was unusually severe, we repeated the ultrasound abdomen and hemoglobin after four hours to look for other internal organ injury; both were negative. A small degree of peri-renal bleeding accompanies every renal biopsy and even uncomplicated biopsies will result in a decrease in hemoglobin of almost 1 g/dL. Thus, a reduction of hemoglobin more than 2 g/dL is associated with over 90% of clinically recognized complications. However, this is not completely reliable. Khadehdehi et al  showed that patients with a stable hematocrit (Hct) at six hours post-biopsy were at low risk for bleeding at 24 hours while being hospitalized. Whittier et al showed that factors which predispose to complications after renal biopsy include renal insufficiency (>1.2 mg/dL), poorly controlled hypertension (diastolic BP > 90- 110 mmHg), and a prolonged bleeding time. Patients with estimated glomerular filtration rate (GFR) of <40 mL/min have a sixfold increase in risk, and even those with estimated GFR of 61-80 mL/min have a twofold increase in the risk of serious postoperative bleeding compared with patients with normal renal function. Patients with serum creatinine ≥5.0 mg/ dL were 2.3 times as likely to have a complication. Manno et al  showed that female gender, younger age and prolonged partial thromboplastin time are potential predictors of post-biopsy bleeding complications. Conditions cited as predisposing to the formation of AVFs after biopsy are hypertension,  renal insufficiency, multiple attempts to obtain biopsy material,  and deep renal biopsies. Our patient developed peri-nephric hemorrhage despite having well-controlled blood pressure, not using anti-platelet agents, and normal pre-biopsy bleeding and coagulation parameters. The only risk factor the patient had at the time of renal biopsy was severe renal failure. Severe loin pain that requires analgesia and sedation immediately after renal biopsy in a patient with renal failure warrants careful follow-up of hemoglobin and imaging, even if initial imaging is negative. Further fall of hemoglobin necessitates early evaluation with angiogram, which helps in diagnosing as well as treating rare complications such as pseudoaneurysm and AVF. 1. Mendelssohn KC, Cole EH. Outcomes of percutaneous kidney biopsy, including those of solitary native kidneys. Am J Kidney Dis 1995;26:580-5. 2. Ralls PW, Barakos JA, Kaptein EM, et al. Renal biopsy related hemorrhage: Frequency and comparison of CT and sonography. J Comput Assist Tomogr 1987;11:1031-4. 3. Khajehdehi P, Syed MA, Salinas-Madrigal L, et al. Percutaneous renal biopsy in the 1990s: safety, value, and implications for early hospital discharge. Am J Kidney Dis 1990;34:92-7. 4. Ginsburg JC, Fransman SL, Singer MA, Cohanim M, Morrin PA. Use of computerized tomography (CT) to evaluate bleeding after renal biopsy. Nephron 1980;26:240-3. 5. Rosenbaum R, Hoffsten PE, Stanley RJ, Klahr S. Use of computerized tomography to diagnose complications of percutaneous renal biopsy. Kidney Int 1978;14:87-92. 6. Alcazar R, de la Torre M, Peces R. Symptomatic intrarenal arteriovenous fistula detected 25 years after percutaneous renal biopsy. Nephrol Dial Transplant 1996;11:1346-8. 7. Burkhausen J, Verhagen R, Muller RD. Successful interventional treatment of renal insufficiency caused by renal artery pseudoaneurysm with concomitant arteriovenous fistula. Nephron 2000;85:351-3. 8. Winkelmayer WC, Levin R, Avorn J. Chronic kidney disease as a risk factor for bleeding complications after coronary artery bypasses surgery. Am J Kidney Dis 2003;4:84-9. 9. Whittier WL, Korbet SM. Timing of Complications in Percutaneous Renal Biopsy J Am Soc Nephrol 2004;15:142-7. 10. Manno C, Strippoli GF, Arnesano L, et al. Predictors of bleeding complications in percutaneous ultrasound-guided renal biopsy. Kidney Int 2004;66:1570-7. 11. Eklund L, Lindholm T. Arteriovenous fistulae following percutaneous renal biopsy. Acta Radiol 1971;13:38-47.